Induction cut, also known as the buzz cut, is one of the most preferred hairstyles among men all around the globe. Why? Because it is the most laid back and low maintenance haircut out there ever invented by mankind. God bless the person who came forward with this convenient hairstyle for men. It is also the most preferred haircut among most hair stylists as well. If you are inserted in getting an induction cut then here is a list of seven simple and laid back designs that you can easily sport. Men and short hairstyles go hand in hand for a long long time. Here we come up with 7 best Induction haircut for men that are in vogue style quite for some time now. You can always be a bit creative with your hairstyle. 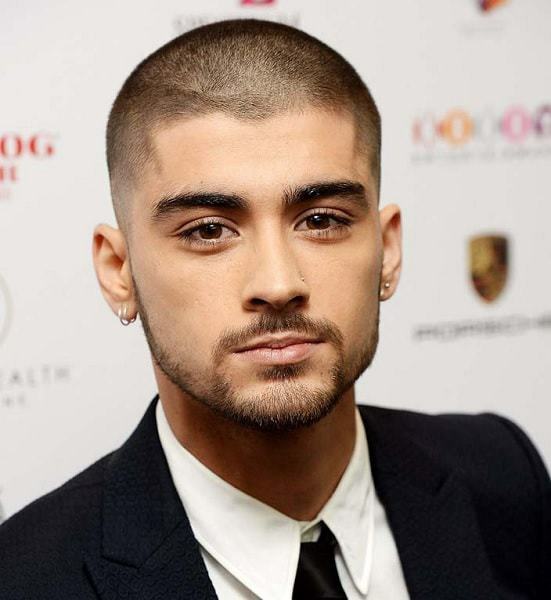 This geometric hairline with a buzz cut has received a lot of love since Zayn Malik and Drake has sported this hairstyle. It does not only look trendy and up to date but is also very low maintenance. This particular trendy induction cut style is amazing for people with deep recession lines. You can use the depth of your recession line in your favor and get your hairline shaved into a pyramid. It looks clean, fresh, and trendy all at the same time. If you want to color your hair, consider these red hairstyles for guys. A classic military cut induction style will never fail you. It is the ultimate go-to hairstyle for a lot of men who prefer to keep their hair short and lead a low maintenance life. It is the best way to look tidy, fresh and fashionably up to date without having to spend hours styling your hair. Add a little wow factor to your induction cut by perming the hair on your crown. The tiny curls and waves in your hair will make an eye-catching statement which will definitely earn you quite a few compliments from your friends and family. If you don’t want to shave or trim all your hair then opt for an induction cut fade. In this hairstyle, your hair length will decrease slowly as you go down to the ape of your neck. It is a subtle version of induction cut that can you can rock without looking too over the top. This is one of the hottest haircuts for men. For those men who still like a little bit of hair on their head, this variant of induction cut is the best. You can ask your hairdresser to give you a flat top induction cut design which includes hair on the crown of your head cut into a flat shape from the top. If your personal style leans more toward the edgier side of the fashion spectrum then this induction cut style is just for you. The Mohawk inspired hair on the crown of your head will make your hairstyle stand out from the rest. These men’s induction hairstyles are not only simple but also quite trendy. A number of celebrities have been seen sporting this hairstyle worldwide. So, sport a stylish induction design and make a statement with your up to date fashion sense.